Deep dish versus thin crust, white versus wheat, and skim versus two percent are all heated food debates. But creamy versus crunchy peanut butter is arguably the most contentious. Pizza preference has a clear geographic association, but the makeup of teams creamy and crunchy is largely unknown. 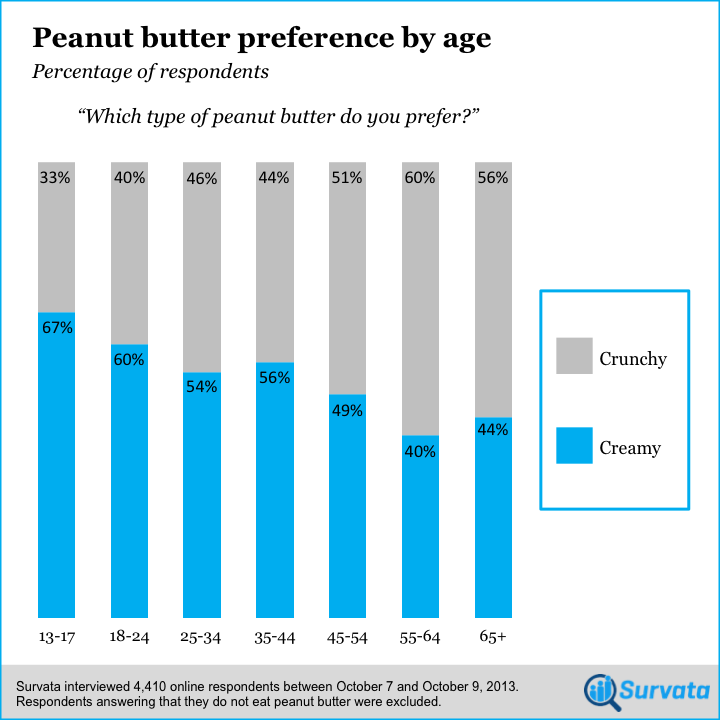 So, we at Survata wanted to get a handle on the demographics of peanut butter preferences. To find out, we used our consumer survey tool to ask 4,410 respondents whether they preferred creamy or crunchy peanut butter. After screening out those who don't eat peanut butter, we found that creamy was the more popular choice by a score of 57% to 43%. Could your peanut butter preference betray your age? Our results suggest that it might, since respondents age 45 and over overwhelmingly chose crunchy over creamy. This trend was reversed in the younger age categories, with 59% of respondents under 45 preferring creamy. 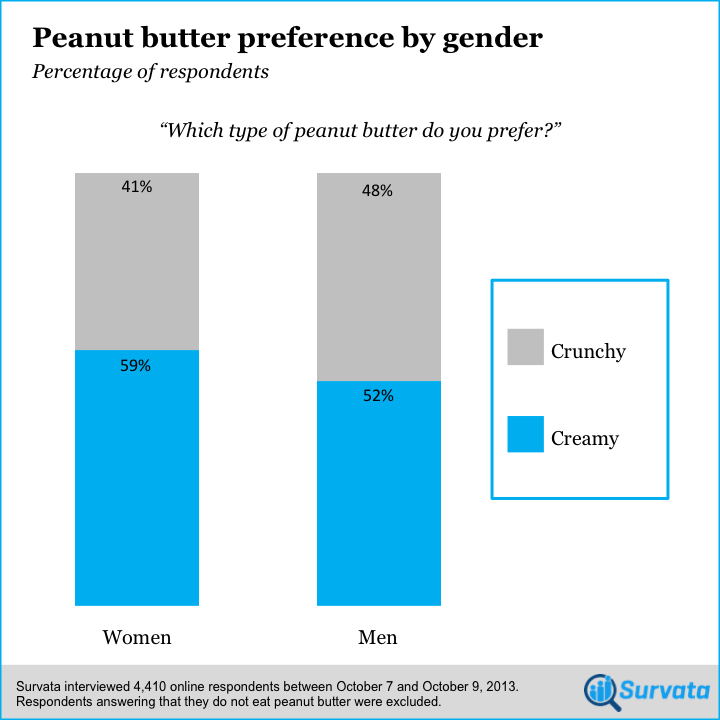 Perhaps crunchy peanut butter possesses some kind of Freudian symbolism, because we found that preference differed slightly by gender. 48% of men preferred crunchy peanut butter, compared to 41% of women. This means men were 17% more likely than women to go for crunchy. Frankly, we were surprised to find significant demographic correlations in peanut butter preference. But, such a survey illustrates the fact that even the most unsuspecting topics can be an opportunity to gain consumer insights. Want to learn demographic preferences about your product? Try Survata today.